Lest we forget what this acronym stands for, let us look again at what HVAC systems are and what they do for us. Heating, ventilation and air conditioning – HVAC for short – is the “technology of indoor and vehicular environmental comfort.” Its goal is to provide thermal comfort and acceptable indoor air quality. Thank you Wiki for explaining that one, because it is important we understand that like most things in life, the heating and cooling equipment we purchase has limited life expectancy. 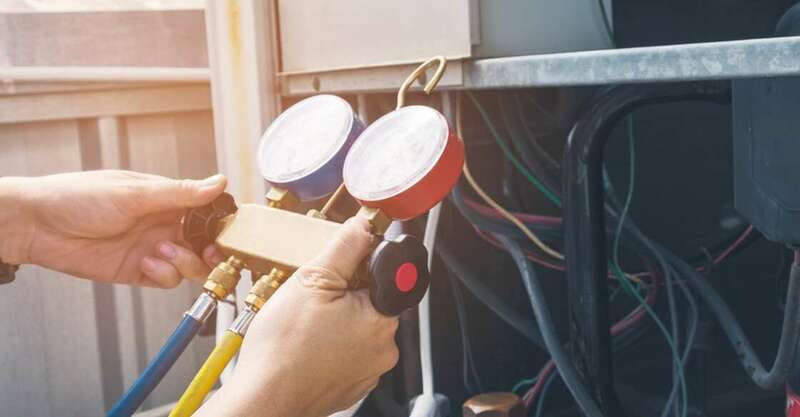 The Department of Energy (US) recommends the replacement of HVAC equipment every 10 – 15 years for air conditioning appliances, and 15 – 20 years for furnace / boiler heating systems. This is according to specific guidelines recommended by manufacturers of heating and air conditioning appliances. For many, it is a clear decision between the costs of replacement as opposed to spiraling maintenance issues surrounding older plant and equipment. Clearly, age is a major consideration when looking at replacement. It is important to know what to look for by way of indications that equipment is reaching the end of its useful life. The argument for replacement strengthens when running costs are on the upward trend. California’s hot summer climate makes having a commercial or home air conditioner a necessity. The air conditioner condenser cools warm air and the air filter removes dust and allergens, providing cool, clean, and healthy air. Just like the autos we buy, central air-conditioning systems in our homes and workplaces have a limited life expectancy. The outdoor components are vulnerable to the elements and suffer huge climatic swings. When your AC is not performing to specification – as you would expect in the heat of summer – you are more likely to fork out more on maintenance from your service provider. Perhaps it is time to do the math and determine where the break-even point is. Blown compressors are one of the signs of imminent replacement of your HVAC system. The heat exchanger is at the heart of any gas-fired furnace. Its job is to transfer heat generated by gas burners to the air circulating through the system. When the exchanger shows signs of cracking or holes start developing, then it is time to replace it. Cracks are the result of too much heat causing the heat exchanger to expand beyond the design limits. Overheating occurs from poorly maintained filters and from onset of old age. Gas exhaust smells in your home tend to indicate poor performance with the heat exchanger. Soot accumulation around the furnace also provide a clue that the furnace is not performing optimally. Ignoring these problems can result in dangerous levels of carbon monoxide in your living space. Your detector should sound an alarm when the system is operating and you need to have a furnace safety check urgently. Global Heating and Air Conditioning offers free, no obligation estimates to residential and commercial clients in the Greater San Diego area. We believe that it should never cost you extra to determine how much the installation of a new unit will cost.